Click the "Week" tab on the main window. Click the "Week" command in the Go menu. Click the week header in the Month view, which can be made visible via the Month View Settings on the Go menu. The Week View shows a single week. The currently displayed week will be shown at the top of the Week View, with left and right arrow buttons for navigating to the previous or next week. The displayed week can also be selected from the Navigation Pane or any of the other tabs in the Calendar View. The Week View supports two different layouts. The first layout shows days as columns with timeslots, similar to the Day view. 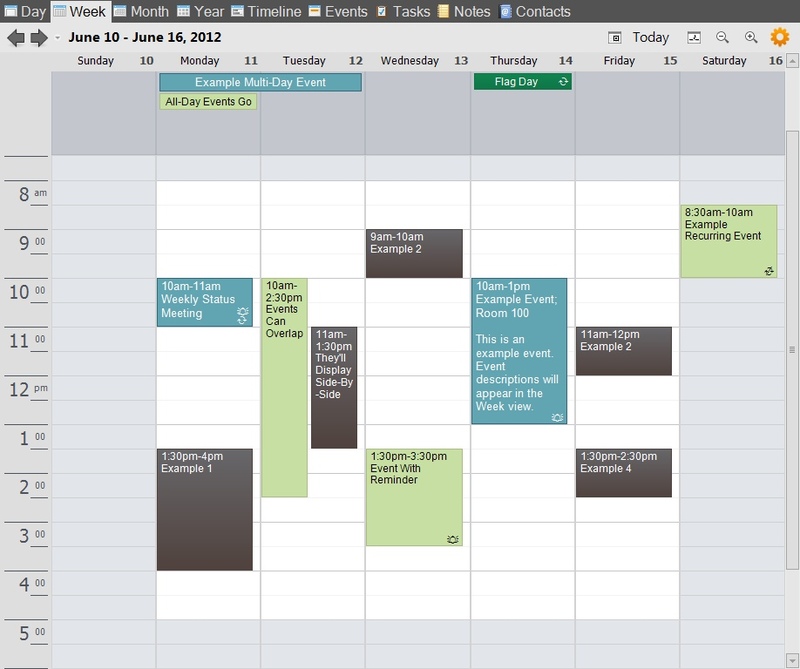 The second layout shows a 3x2 grid, where each day is a rectangle and its events are shown in the order they occur. The preferred layout can be selected from the Week View Settings menu, which can be accessed by clicking the "gear" button in the upper-right corner of the view. 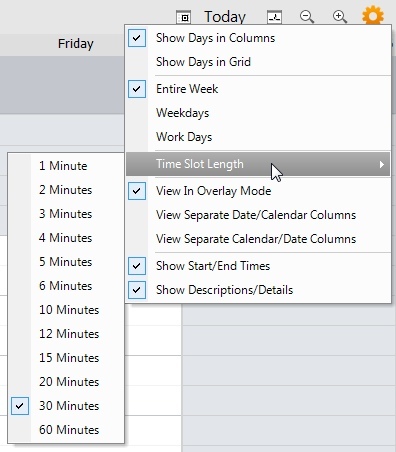 When the "Show Days in Columns" option is checked, the Week View will appear as shown in the example below. Events that have starting and ending times are displayed within their time slots. Events that last all day or span multiple days are displayed in the day header area. Notes will also be displayed in the header area. 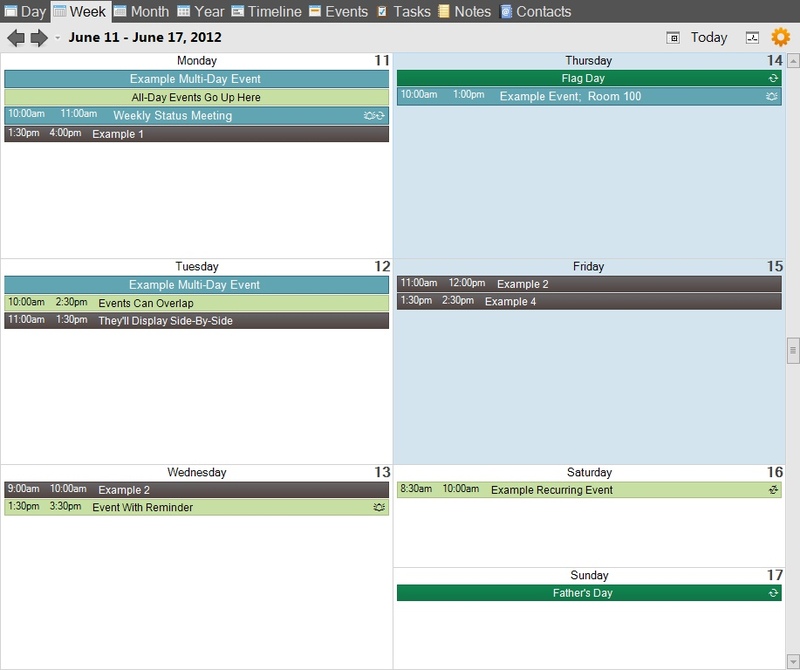 Up to 14 all-day events and/or notes can be displayed at the same time. The is no limit to the number of non all-day events that can be displayed in a single day. Tasks that have associated starting times and durations are also displayed within their time slots. Tasks that have a due date, but no starting time, are displayed in the day header area. 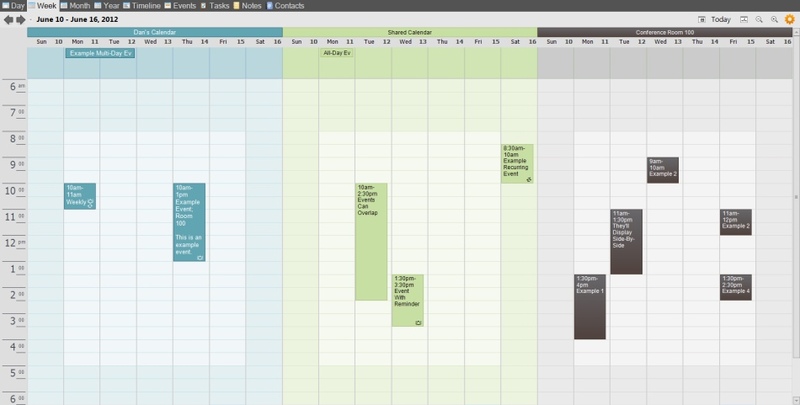 Non all-day events and tasks that overlap with each other are displayed side-by-side in their associated time slots. Time slots that are outside the working hours defined in the Calendar Options will be shaded. The default shading is gray, but can vary depending on the appearance theme selected in the Appearance Options. A secondary time-zone can be displayed along the left edge of the Week View via a Calendar Option. 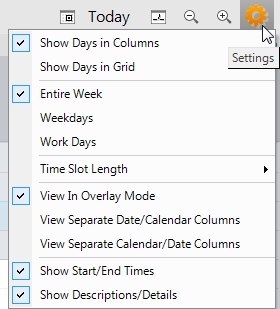 When the "Show Days in Grid" option is checked, the Week View will appear as shown in the example below. If more events are present in a day than will fit in the available space, an arrow indicator will be displayed at the bottom of the day. Clicking this indicator will activate the Day View. Depending on the available space, event ending times and locations will appear. If space is limited, these may be suppressed to enable more room for event titles. The starting day in the upper-left corner will match the first day of the week specified in the Calendar Options, except if that day is Saturday or Sunday, since those days are compressed. The color of date numbers can be adjusted using the Appearance Options window. For example, weekend dates can be colored red. Additional settings are available when in column layout mode. These settings aren't applicable when in grid layout mode. When this option is selected, 7 columns will be shown for an entire week. The width of each column will be the same and there is no way to adjust some day columns to be wider than others. If you don't schedule events on weekends, and your monitor space is limited, try the Weekdays or Work Days settings instead. Only Monday through Friday will be shown. Only days that are marked as work days in the Calendar Options will be shown. The displayed timeslot length can be adjusted between 1 and 60 minutes. The default timeslot length is 30 minutes. Selecting a larger timeslot length could reduce scrolling, but will also limit the amount of space available for event titles and descriptions. When viewing in overlay mode, all calendars will be merged into a single view. In other words, each date will be shown only once, and if multiple events belonging to multiple calendars exist within those dates, the events will be overlaid in the day. Tasks and notes are also overlaid. There are two options for how columns are to be arranged when overlay mode is disabled. When the "View Separate Date/Calendar Columns" option is selected, each date column in the Week view will contain separate sub-columns for each visible calendar. The calendars that are visible can be adjusted using the checkboxes in the Calendar List. When the "View Separate Calendar/Date Columns" options is selected, each visible calendar will be a column, with each day of the week being shown as a sub-column of each calendar column. When this option is checked, start and end times will be shown in the event or task blocks, eliminating the need to visually scan over to the time bar along the left side in order to see when an event or task occurs. Uncheck this option to make more space for item titles and descriptions. When this option is checked and enough space is available, descriptions and details will appear in the event and task blocks. This option can be unchecked if your workplace requires this information to be hidden (i.e., HIPAA regulations), or if you want to keep details of events away from prying eyes.